Hi there!! 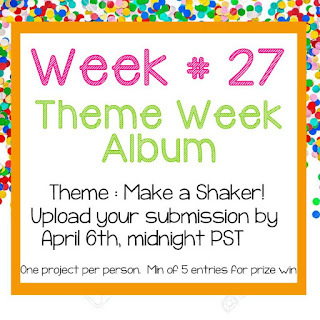 Nicole here today from "teachdanz" with some inspiration for you for our new theme week challenge - "Make a Shaker". I decided to make a shaker card for Easter. I used "Jemma - Happy Easter" for my image and colored her in with my copic markers. I created my shaker opening using the Jaded Blossom Scallop Circle Dies and Jaded Blossom Stitched Circle Dies. I added the cute bunny border using the Jaded Blossom Spring Banner Dies. If you are anything like me you probably have a ton of sequins in your stash that could get a little loving ;) If you don't own a physical Stamp Anniething stamp make sure to check out the new digital stamps available in the store for purchase now. I can't wait to see what you create for our new challenge!! - Create a new "Shaker Card" with a Stamp Annie Thing product on it. -Share your creation at Our Facebook Group HERE by April 6 2018.